As hit and miss as season three of AMC’s zombie drama The Walking Dead was, the impending Blu-ray release is going to arrive in one hell of a package. One of the most disturbing and enduring images of the season was the Governor’s (David Morrissey) aquarium wall full of severed heads. And that’s exactly what your shiny video discs will arrive in, a box fashioned to look like a tank full of disembodied heads. The Walking Dead is no stranger to unique packaging. The first season arrived on my doorstep, unannounced, in an envelope with a big bloody boot print on it. I feel like that should have raised more eyebrows at the post office than it did. Season two came in a zombie head with a screwdriver sticking out of its eye. This is somewhat more tasteful than an impaled undead eyeball, or at least much less likely to frighten any small children who may peruse your movie collection. Maybe. It’ll still scare the crap out of the ones with a keen eye for detail, but it isn’t as obvious as a full-sized head sitting on your shelf, staring them full on in the face. Are there lights in this box? How does that work? Do you need batteries to power your Blu-rays? We really are living in the future, aren’t we? While this is cool, I don’t know if its $105 cool. That’s a lot of money to spend on what was, in the end, an up-and-down season at best. 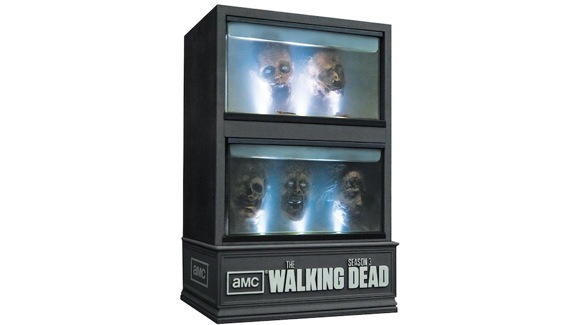 But if you’re a huge Walking Dead buff, especially you collectors out there, and have some extra cash sitting around, go for it.